An invitation for you to find and choose WHAT IS TRUE FOR YOU. What is "I was Supposed to be Happy"? At age 32, Lisa had reached all of her goals in life: she had enjoyed a successful career, she was on her way to building a thriving business of her own, her longing to become a mother had been fulfilled, twice, and behind the white picket fence she shared her life with the man of her dreams. Things were truly picture perfect. So why then wasn’t she happy? Trying to find the answer brought Lisa to surprising discoveries of what had shaped her choices in life and what the missing pieces to her happiness was. 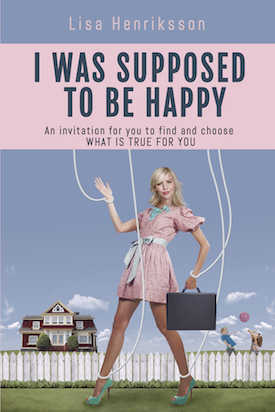 In I Was Supposed to Be Happy, Lisa openly shares her journey from a life where physical pain, stress and sadness were everyday companions, to a much more intimate, rewarding and exciting life and living. This is a story about going beyond the expectations, opinions and points of view of right and wrong that we’ve made real and true in our lives, or spent years rejecting. This is a story about a journey to real choice, to finding what is true for you and to creating a life where the pressure is off and infinite possibilities are very real. Are you ready? This is not an instruction manual. My wish is that this book will inspire you to ask yourself questions about WHAT IS TRUE FOR YOU, what you really long for and what you could choose when you look beyond all of the expectations and the judgments that shape your choices today. My desire with this book and everything that I do and BE today is to create a different world – a conscious world where we are KIND, GRATEFUL, VULNERABLE and in ALLOWANCE of each other and ourselves. A world filled with more happy people. And I know it’s possible. After a successful career in journalism, politics and digital communications – leading her as a reporter all the way to the White House – Lisa Henriksson shifted paths in search of new ways to contribute to a better and happier world, the expansion of consciousness and greater possibilities for all of us. Since 2010, Lisa is an Access Consciousness® Certified Facilitator. She travels the world coaching and facilitating individuals and groups to accessing their knowing and awareness. Lisa is the co-founder of Wisdom Stockholm and the founder and CEO of yoga and health centers Egen Tid (transl. Your Time). Lisa lives with her two children in Stockholm, Sweden.